*This pro­gram is now full. How­ever, if you would like to be added to the wait list please con­tact Linda Gonnella at lg457@cornell.edu or 845–688-3047 ext. 0. Reg­is­ter now for a Win­ter Snow­shoe Stream Walk along Rochester Hol­low trail at the end of Matyas Road near Big Indian, NY from 10:00 a.m. to 1:00 p.m. on Sat­ur­day, Feb­ru­ary 2, 2019. If there is not enough snow for snow­shoe­ing, a “No-Snow” date is sched­uled for the fol­low­ing Sat­ur­day, Feb­ru­ary 9. If there is still no snow on this date, a reg­u­lar stream walk will be held with­out snow­shoes. Snow­shoes and walk­ing poles will be pro­vided, though, par­tic­i­pants are encour­aged to bring their own gear. Those with lim­ited or no expe­ri­ence snow­shoe­ing are encour­aged to attend. Instruc­tion on how to snow­shoe prop­erly and safely will be given before ven­tur­ing out on the trail. The walk will be approx­i­mately 2 hours in length along a well-maintained trail on NYS Depart­ment of Envi­ron­men­tal Con­ser­va­tion (NYSDEC) For­est Pre­serve land. Dur­ing the walk, edu­ca­tors from Cor­nell Coop­er­a­tive Exten­sion of Ulster County will share infor­ma­tion about local streams and pro­tect­ing water resources, and we will inves­ti­gate signs of local wildlife. The walk will be 1.5–2 miles in length roundtrip with fre­quent stops to point out inter­est­ing fea­tures of the stream or to dis­cuss envi­ron­men­tal top­ics. The walk will end at a NYSDEC camp­site where par­tic­i­pants can warm up by a camp­fire with hot drinks and snacks. Meet at the DEC trail­head park­ing lot at the end of Matyas Road by 10:00 am. The event is free of charge but space is lim­ited. Please reg­is­ter early to hold your spot. 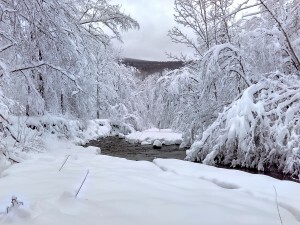 Reg­is­ter online at https://reg.cce.cornell.edu/snowshoe-stream-walk_251 or con­tact Linda Gonnella at the AWSMP office at lg457@cornell.edu or 845–688-3047 ext. 0.